Veggies in Yogurt?! Meet Stonyfield YoBaby Veggie! It’s the Yogurt We’ve All Been Waiting For! It’s no secret that mealtime with kids is no picnic for parents–especially when you have a picky eater on your hands. Trying to find healthy food options that your kids will actually eat can be difficult (to put it mildly). This is why a go-to option in our fridge, and one that I recommend to other parents, is yogurt! There is so much that you can do and make with yogurt AND it is a great first food for baby once baby turns 6 months old. A yogurt for babies that I have always recommended is Stonyfield Organic YoBaby yogurt. Why? For over 35 years this company has made it their mission to create healthy, organic products because they know that it means healthier families and a healthier planet. They are true pioneers and Stonyfield is leading the way once again with something new . . .
Up until now there have only been fruit yogurts on the market: banana & mango, peach & pear, apple & blueberry, but no veggies. Fruit yogurts are great and delicious, but how amazing would it be to pack in all of the probiotic benefits of yogurt while providing our little ones with some vegetables?! We want our children to eat more of their veggies and I thought what better way than to have veggie yogurt! It would be a delicious treat that both moms and babies would love. Well, apparently, Stonyfield thought the same thing because they just released TWO NEW savory whole milk yogurt flavors for kids and they are made with organic vegetables!! We’re all freaking out about it! (In the best way possible. 😉 ) Here are five things parents need to know about this new yogurt. 1. Stonyfield’s best-selling organic baby yogurt now comes in two new savory flavors formulated with organic purple carrot and sweet potato! These are tasty and healthy options that will help expand baby’s palette. 2. They are made with real purple carrot and sweet potato and no added sweeteners! YES!! 4. In addition to the yogurt’s blend of live and active cultures, YoBaby contains the probiotic BB-12, which has been clinically shown to support digestive health. The probiotic BB12 added to YoBaby, has been shown to have a digestive health benefit, when consumed regularly as part of a balanced diet and healthy lifestyle. Gut health is essential to having a healthy baby. These yogurts will help. 5. It’s made with only Certified Organic ingredients. I love this! Choosing organic is something that all parents can feel great about especially when nourishing their child. Parents can start feeding their child YoBaby as early as six months old. What an awesome way to introduce babies to their vegetables as well as the yogurt category! So, Where Can You Get It?? 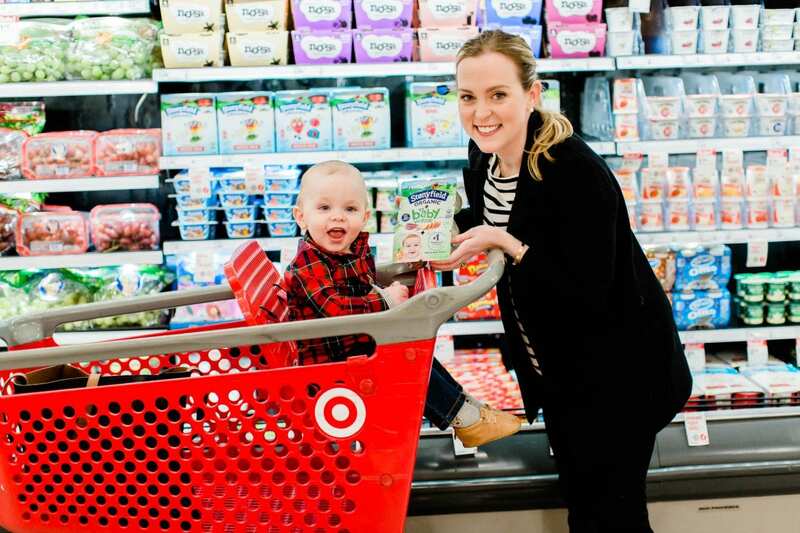 Currently their YoBaby Veggie yogurts are only available at Target. (Another reason to love Target, right?!) Go to the grocery section of your local Target store and head to the yogurt display. You will find it on their shelves amongst the other Stonyfield products. 🙂 Available nationwide!